Skin cells are renewed every 28 days. Mirroring this same regenerative rhythm, Renewing Night Conditioner should be used for 28 days in place of your daily night-time skin care. We recommend one course of treatment per year for each decade of life (for example three times a year at the age of 30). Apply nightly after cleansing. Break off the top of two ampoules, squeeze liquid into palms and press gently and evenly into the face (including the lip and eye areas), neck, earlobes and décolleté. From week 4, only use one ampoule. Outside this application period, we recommend a Dr. Hauschka Serum for oil-free night care and Dr. Hauschka daytime products in the mornings. Very nice product, quick to apply at night and ultra light, leaves skin fresh and smooth in the mornings. Good discovery! Really does miracles in just 28 days! My skin is prone to spots and after using this serum, they all were gone. This is of course in line with good diet and drinking plenty of water. Very happy with results and will be buying it again soon. The renewing night conditioner has brought life into my skin. It feels soft, radiant and hydrated. I highly recommend it. 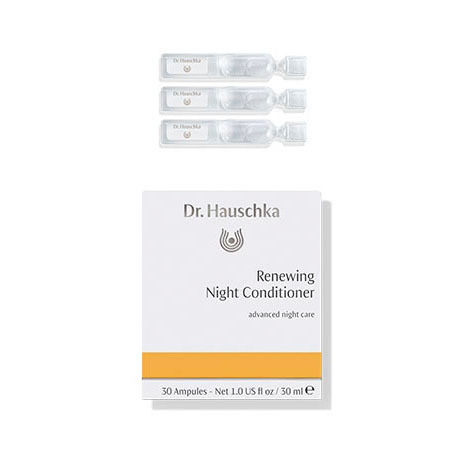 Dr.Hauschka Skin Care's oil-free approach to nighttime skin care respects the skin's inherent wisdom. Heavy, oily night creams do not allow the skin to "breathe" and can inhibit the skin's natural functions when it is most active. At night after cleansing, apply only non-oily Dr.Hauschka Renewing Night Conditioner, Sensitive Care Conditioner, Facial Toner or Clarifying Toner. Skin that is accustomed to heavy night creams may feel tight or dry during the transition to Dr.Hauschka's oil-free night routine. Dr.Hauschka Revitalising Mask treatments in the late afternoon or early evening can help ease this temporary condition.